I consider stump dirt to be a miracle planting aid. But what is it? 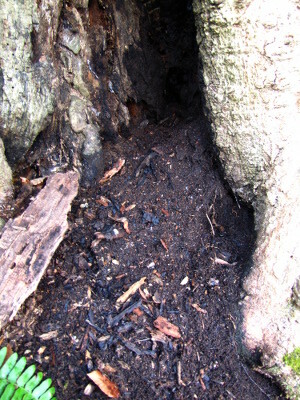 The obvious answer is --- that moist, dark, earthy-smelling organic matter found inside decaying trees or logs. Different trees create stump dirt of varying quality; my favorite source by far is our ancient hollow beech halfway up the hillside, while box-elders product lower grade stump dirt. Maybe hardwood stump dirt is better than softwood? Naysayers on the internet report much lower NPK values for mushroom compost, though --- closer to 0.7-0.3-0.3 --- and I suspect our stump dirt is at the lower end of the fertilizing spectrum. That would explain why the garden beds I treated with stump dirt last year didn't show much growth --- stump dirt isn't a replacement for compost. Instead, it makes a great ready-made potting soil and can also be used like peat moss to fluff up organic-matter-poor soil. 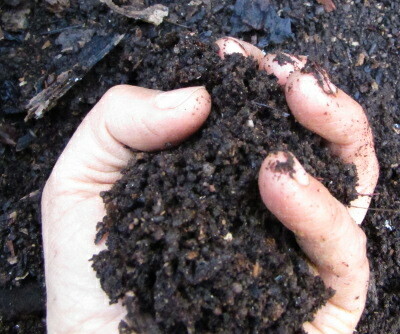 If we ever had enough to apply stump dirt to our garden in large quantities, I suspect it would act a bit like biochar, providing spots for microorganisms to grow unhindered. And stump dirt from deep-rooted forest trees is probably even higher in micronutrients than the analysis above portrays. All of that said, you can't buy stump dirt, and you only find it in middle-aged to old forests. I mine a couple of five gallon buckets every year out of our beech tree, but save it for extra-special occasions. Another reason to have a mature woodlot on your property, perhaps? Never see another chick drown when you switch to our chicken waterer.